This hymn was written by American Baptist singer, song-writer and music editor Baylus Benjamin McKinney (1886-1952). Copyright for it was first registered in 1942 by Broadman Press. With meter 8.7.8.7. with refrain, the McKinney's tune is sometimes referred to as GLORIOUS NAME. 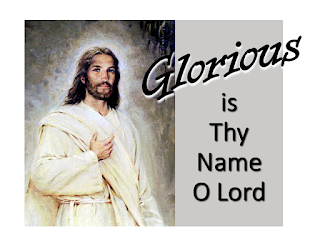 Choral arrangement of this hymn with "Glorious" by Chris Tomlin and Jesse Reeves. The lyrics are copyright so cannot be reproduced here. But they are currently available on page 19 of this document. Glorious glorious is thy name, O Lord!